My love of all flies ‘leggy’ continues and whilst surfing the Internet in the depths of winter 2010 I came across these extraordinary creatures. I’ve christened them, ‘Scuba Diver’ Spiders but their correct name is Argyroneta Aquatica. 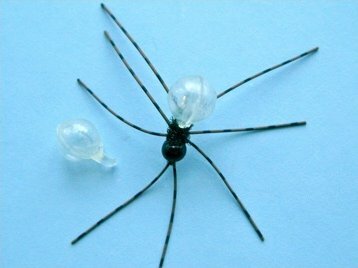 They’re also known as ‘Diving Bell’ spiders. Gathering air from the surface, they have the ability to make an air bubble nest underwater, where they raise their offspring. They breathe by carrying a bubble of air on the fine hairs of their abdomen. This bubble gives the rear half of their body a silvery appearance. Found in freshwater lakes and ponds, they grow to 10-15mm long and live on Phantom Midge larvae, Mites and Mayfly nymphs. They in turn are eaten by frogs and, I’m delighted to say, fish! 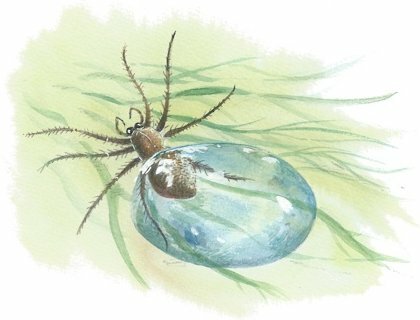 If you are a male water spider you can look forward to a reasonably long life. 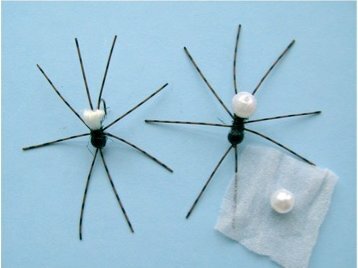 This is because, unlike some other spiders, the female of your choice will not eat you after mating! What a comforting thought! 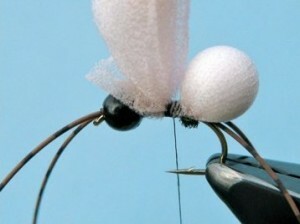 Here are the tying steps for my pattern; a few tips on how to fish it follow. Hook: Kamasan B160 Size 10. Thread: Fine. I use black Sheer. Head: Black glass bead. 3 or 4 mm. Legs: Veniard Barred Rubber Legs. Brown or Olive. Body: Peacock Black Ice Dub. Air Sack: White Poly-Ball wrapped in stocking. 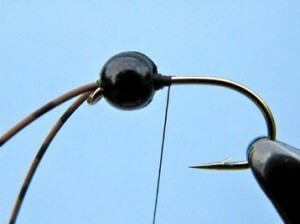 Place a 3or4mm black glass bead on the hook and secure the hook in the vice. 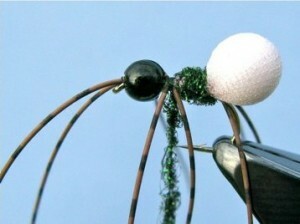 Leave the bead at the back of the hook and tie in two barred rubber legs facing forward, one either side of the eye. Trim the waste. Build enough thread behind the eye to hold the bead firmly when slid forward. Secure and clip the thread. Add a little Super Glue to the thread wraps and slide the bead forward into position. Restart the thread and wind it to the rear of the hook to above the barb. Tie in two more rubber legs, one either side of the hook shank, facing backwards. Add a little Peacock Black Ice Dub over the wraps. Directly over the dubbing, tie in a Poly ball wrapped in stocking and pointing backwards over the legs. Trim the stocking, dub over the wraps and dub forward halfway towards the bead. Tie in another pair of legs either side of the hook shank and leave the thread hanging between them. Make a fine rope of dubbing and use this as you wrap forward to secure the legs in the required position. Finish dubbing behind the bead and whip finish. Add a little glue to the wraps. Now carefully trim the legs. As a rough guide I suggest you leave the legs twice the length of the body. Fishing the ‘Scuba Diver’ Spider. The SDS spends very little time on the surface of the water so we want our fly to sink, but as slowly as possible. Make sure your SDS is wet before you test its sink rate. Once calculated, decide on your method of retrieve. There are three ways that I’ve found to be successful. Two fairly straightforward and one that might fall into the ‘radical’ category. Let’s assume you know the approximate depth of the water and that the bed of your lake has a covering of weed where our spider is likely to be found. Simply cast out, count your fly down to the appropriate depth and retrieve your fly very slowly across the top of the weed. Cast out and count the fly down to where you feel it has reached the top of the weed then lift the rod slowly to bring the fly to the surface. Once it’s there, let it sink again. Repeat the process until you have brought it back to the bank. It’s a little like the ‘sink and draw’ technique you might use when coarse fishing for Pike with a dead bait. I’ve found the secret is to keep the rise and fall of the fly as slow as possible, and to use the longest leader with which you are most comfortable. First let me say I’ve nothing against using plastic strike indicators in rough fast flowing rivers, but I usually draw the line at tying bubble floats onto the back of my flies! However, a chum of mine who spends a lot of time fishing small reservoirs came up with this idea that he assures me ‘works like a dream’! First re-tie the fly but instead of representing the air bubble with a stocking covered Poly Ball, purchase some small, clear ‘Unibobbers’. Cut the small ring attachment in half and lash the remainder to the back of the hook and secure with some Super Glue. Cover the wraps with Ice Dub and continue with Step 3. Fish on a fast sinking line with a short leader as you would a Booby! Retrieve slowly but every now and again give a sharp tug that should pull the fly down into the weed. Pause to let it float up again then continue the slow retrieve. Previous Previous post: Me and the Mrs Fishes!